To say Pokemon GO is ‘life-changing’ is probably an exaggeration by most of us. However, for a particular Singaporean, the game has proved to be the best medication. 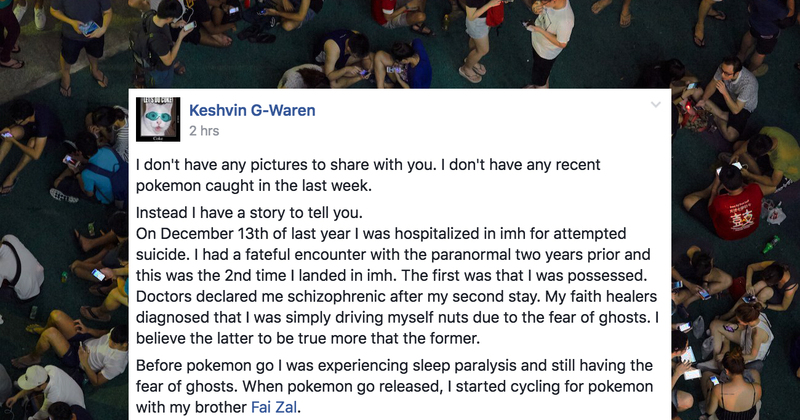 Just this morning, Singaporean Facebook user Keshvin G-Waren posted his very personal story on the (still) highly-active Pokemon GO Singapore group, which is usually filled with contributions from players on nests, tips, sightings of rare Pokemon around the island, and even funny anecdotes during Pokemon hunting trips. His post, however, was vastly different from the rest. I don’t have any pictures to share with you. I don’t have any recent pokemon caught in the last week. Instead I have a story to tell you. On December 13th of last year I was hospitalized in imh for attempted suicide. I had a fateful encounter with the paranormal two years prior and this was the 2nd time I landed in imh. The first was that I was possessed. Doctors declared me schizophrenic after my second stay. My faith healers diagnosed that I was simply driving myself nuts due to the fear of ghosts. I believe the latter to be true more that the former. Before pokemon go I was experiencing sleep paralysis and still having the fear of ghosts. When pokemon go released, I started cycling for pokemon with my brother Fai Zal. That’s when everything changed overnight I went from telling my friends I couldn’t go out after dark, to cycling through bedok reservoir at 3am. I was single minded in my quest for pokemon. Within 2 weeks I stopped taking my anxiety medication and halved my dosage of antipsychotics. I dropped from 113kg to 106kg at present. I became fearless. I didn’t care about ghosts, I just wanted snorlax. I now have 4. Now that the maps are down, I started playing nerf again and started learning how to skateboard. Next month I’m taking up snorkeling and lightsaber dueling. 1) If You are Singaporean, you are born a Lion. How you find that courage and will to say that you are one does not matter. Stop thinking you are a mouse. 2) Stop fearing what you cannot control, instead totally disregard it. Focus on the task at hand and give it your all. You only get one shot sometimes. 3) Never say its impossible, I couldn’t cycle 10 km in 6 minutes before this but I’ve done it for snorlax and Muk. I couldn’t go out after dark at first . I checked my fear at the door and cycled through some of the worst places to go to at night. 4) If you have suffered from depression, anxiety or suicidal thoughts. Stop the cycle of repeating it in your mind. Break the habit and pour yourself into physical activity, give it 110%. Within a week you will feel the difference. Take your medicines, pray hard and sweat hard. 5) Never underestimate the value of your life. You may feel small but trust me you are capable of great things. You won’t know it until you push yourself. My navigator and riding partner Fai Zal for being there with me, pushing me for every hunt. Most of all my family, for being there when I had given up and never giving up on me. Please share this story, I owe part of my recovery to this game. Let #niantic know that they are doing god’s work. Let those that have given up know that if you dig deep, focus and push yourself recovery is possible. Let every Singapore born know that there is a lion inside each and every one of us, it’s just waiting to get out. Keshvin’s post has garnered over 500 likes within just one hour of posting. Personally, I follow the group and have users’ posts (some also very ‘like’-able) pop up on my feed from time-to-time, but I can safely say that this is one of the most well-received posts on the group so far – and for very good reasons. Not only was he brave enough to reveal the intimate details of his story, he also used the chance to share the lessons he got from the process with the rest of us – all of which are definitely useful. The game has been getting a negative reputation due to cheaters and players with absolute disregard for their surroundings, but as a player myself, there are also many plus points to the game, and the community spirit that comes along with it. Strangers become momentary friends when there’s a sighting and everyone’s frantically tipping each other off; friends become even better friends when you’re spending your weekends walking around parts of Singapore you’ve never thought of going to before. And Facebook groups become a place for all to share their stories, and also one where we can send words of encouragement, even without being Facebook ‘friends’. Keshvin’s post definitely set the tone for the rest of our week, and we hope it set yours too.